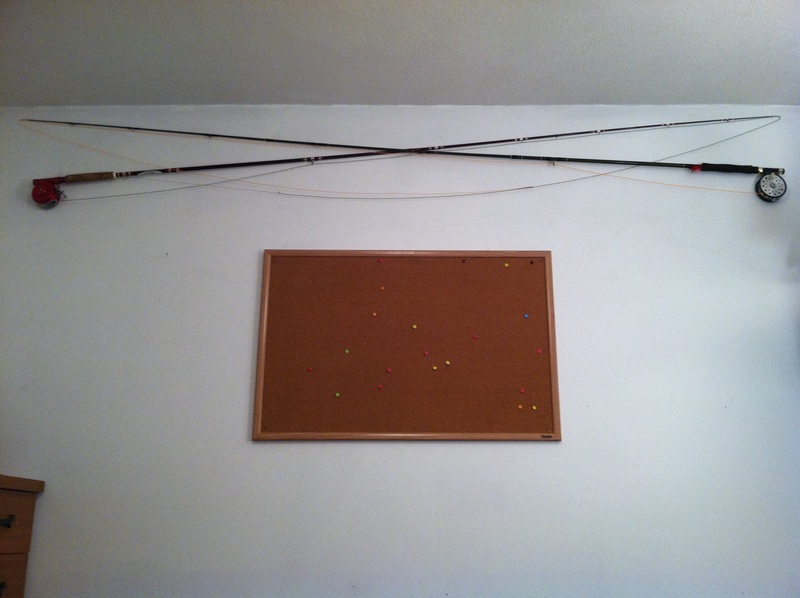 I seized the opportunity to decorate the office in some antique fly tackle my parents have picked up for me at garage and estate sales. 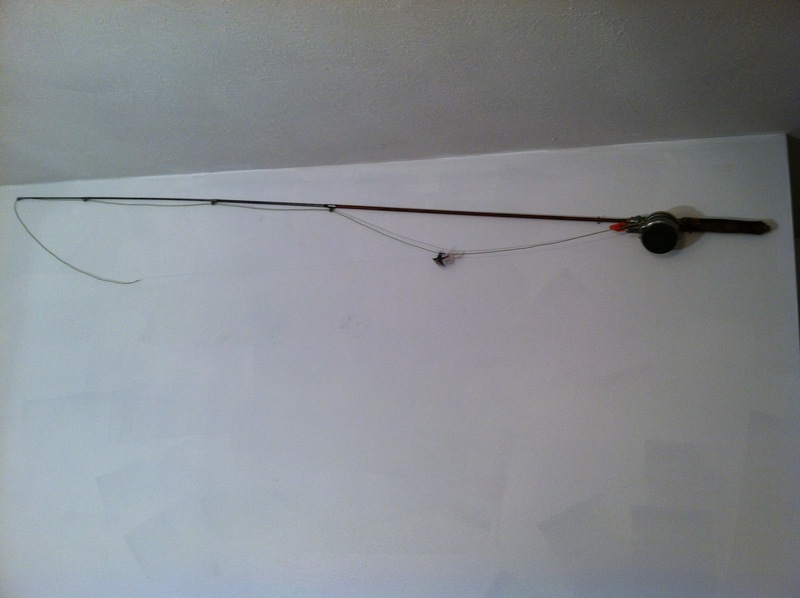 I’ve spent most of the night hanging some old fly rods on the walls. While you can spend hundreds of dollars on a fly rod, this post is to show that a first rod can be very affordable. I got started on fly fishing 2 summers ago after watching a guy fish next to me at Holmes Lake with a fly rod and being mesmerized. It took a little convincing, but I convinced my wife to let me spend some money and buy one. I didn’t have the several hundred dollars necessary to buy a nice rod, and not knowing if I would like or even be able to fly fish, I decided on an entry level rod. I decided on this… mostly because it was the cheapest rod that Cabela’s Kearney store sold. This is the Cabela’s Cahill Fly Rod Combo. It came with the rod, reel, backing, fly line, and leader. This combo and a box of trout flies cost me around $75. I have been impressed with this rod since the day it came out of it’s box. It was an excellent first fly rod. I bought a 9 foot, 8 weight rod on the advice of a salesmen (who I would later realize knew nothing about fly fishing… that will be a later post), who recommended it would be good for bass fishing. In hindsight, I wish I would have gone with a 5 weight rod. A 5 weight is a better middle of the road rod… a good rod for panfish and small bass… which is what most beginners will be fishing for. I think a 5 weight is also a better weight to learn on since it feels like it casts a little easier for me. A 9 foot pole is a good first pole length for still water fly fishing since it helps keep your line higher in the air during your cast… and the razor sharp hook tied to the end of it that much further from your body! I have never taken fly fishing lessons… I would recommend them as it would save you later having to fix faults in your casting… but after a failed first trip to Holmes Lake where I deposited about a third of my flies in the top of trees or snapped them off over the lake, I managed to get the thing to fly cast. Other then wanting a smoother casting rod after i became more experienced, the only bad thing I can say about this combo is the reel… the drag is pretty useless and has always seemed flimsy. I have since replaced the reel with Cabela’s next model up their price points. However, my original 8 weight Cabela’s Cahill Fly Rod is still in my rotation… it comes on the float tube with me regularly for bass fishing. The 8 weight does a decent job casting large bass bugs. And since the heavier rods tend to have more of a back bone, I always have this rod with me whenever I am in “big fish water”.